Posted on January 28, 2016 by No Map Required Posted in Places, Thoughts, Uncategorized, United States	. Late this afternoon it hit us: This is our very last day outside US borders! At least for THIS trip around the world. Tonight we go to bed for the 448th time on the road and tomorrow we sleep in America. WOW! Or maybe more appropriately, HOLY SH*T!! Today, our last full day in Iceland, was spent on a tour of the Golden Circle. 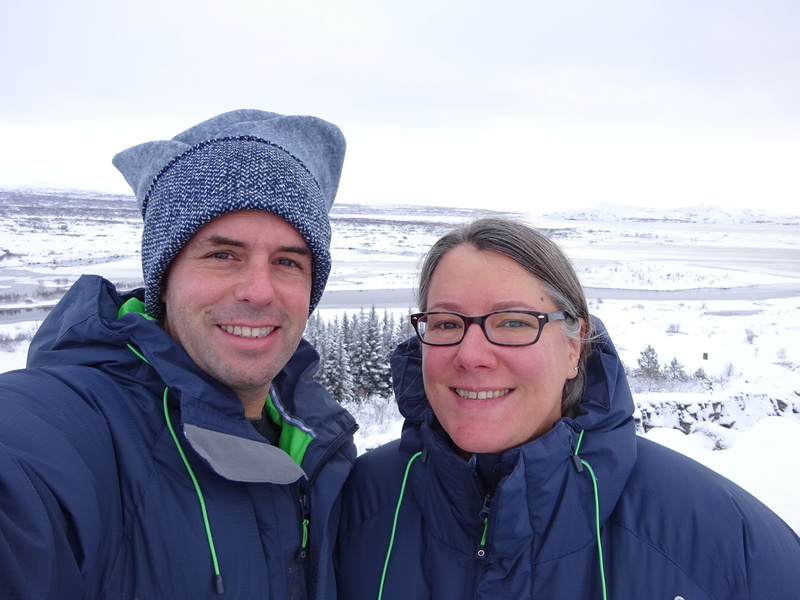 Behind us is the divide between the North American and Eurasian tectonic plates. We feel divided between the continents ourselves at the moment, so this seems about right. Safe to say we have mixed feelings. Mostly we are excited…though with a dash of devestation occasionally hitting one of us in the gut. Luckily we’ve never been hit at the exact same time, so we’ve been okay. Only one of us has to keep it together at any given moment – that’s one of the many lessons we’ve learned on the trip. We are working very hard on thinking postive and looking forward to the good stuff that awaits in Seattle – like great friends and delicious tap water! Also learned that I can’t not squint when Aaron makes me stare into the sun…but at least I keep smiling. 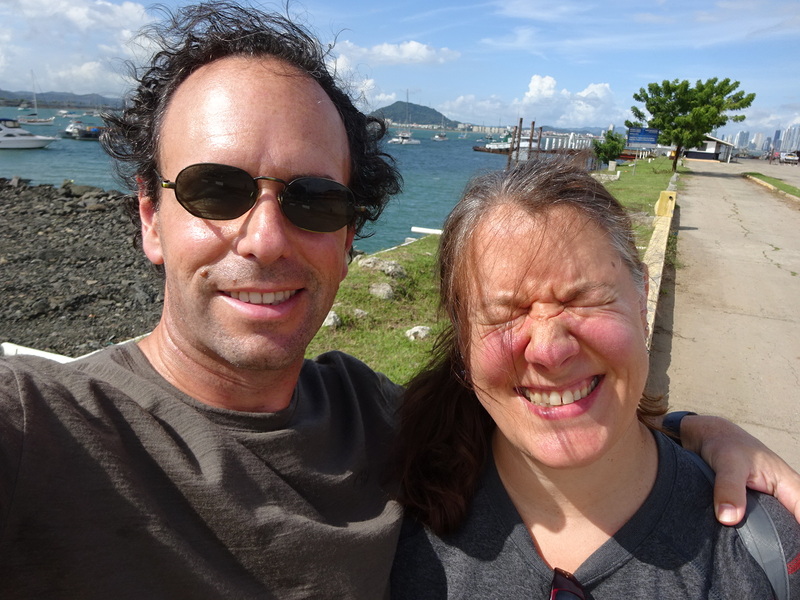 Bridge of the Americas back in Panama behind us…holding another two continents together. This afternoon we were a little sad and wistful with the thought that this part of our adventure is coming to a close, but then this evening we got excited looking at photos of our Mongolian rug and Tanzanian fabrics and imagining how those will be our paint palette inspirations as we give our house a quick sprucing-up before we move back in. I think it’s safe to say that that’s not something we would have done pre-trip! We don’t begin to understand yet how we’ve changed over the last 15 months. In fact, we don’t feel changed….but then again, look at the paint chips. Our inspirations come far-and-wide now. We’ll keep you posted on what else we discover about ourselves beyond just mixing Mongolian and Tanzanian textiles. To be fair, our kitchen is school bus yellow so it’s not like we’re afraid of color, but now were going for it – bring on the bright blue and the dark maroon! This is also far from our last blog post, so no worries there! If you keep reading, we’ll keep writing! We have several posts in the hopper all ready to publish and quite a few on our list of things we want to write about. Look forward to stories of Amsterdam, Sweden, and winter snorkeling!! Plus more street art blogs! And we’re visiting Boston before heading to Seattle, so I’m sure there’ll be something Beantown-ian, too. 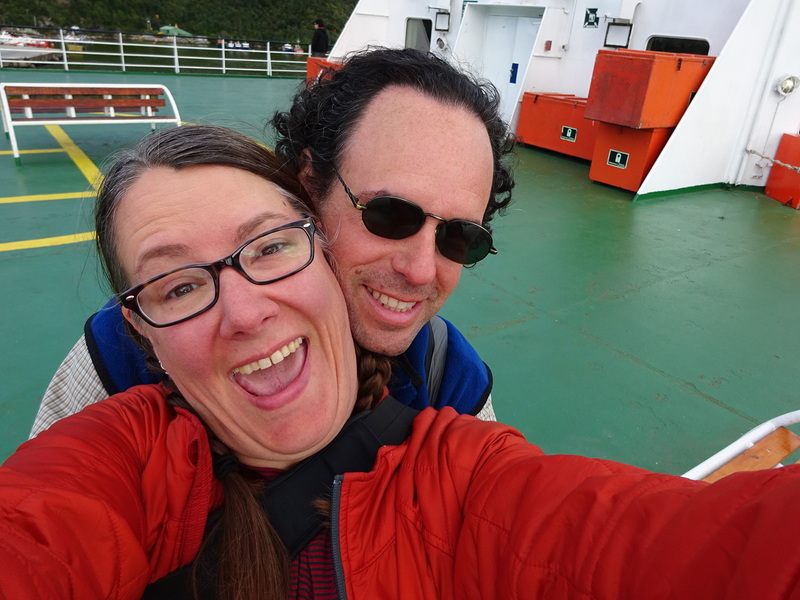 Yes, we’re flying back home, but we’re not done traveling, we’re not done blogging, we’re not done adventuring and we’re not done enjoying. As you know by now: fun follows us, so we best keep moving! 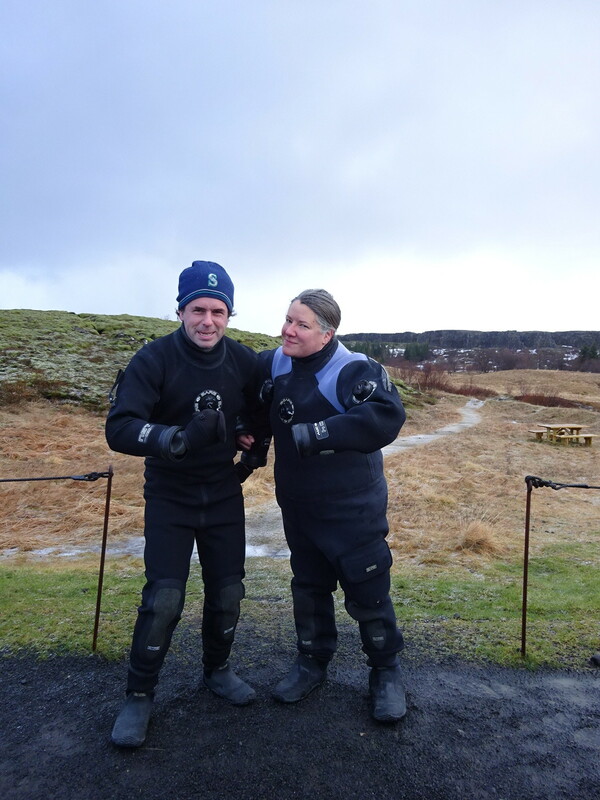 You won’t want to miss this one: Snorkeling in Iceland in January? Why, yes! Blog post is underway! Tomorrow we arrive in Boston to see some friends we’ve made during our travels and poke around one of my all-time favorite cities. Then it’s on to Seattle where more friends await. Reunions are already in the works. Plus we can’t wait to start our Something Big projects – namely: Anner gets a new job and Aaron builds a masterpiece. No problem. Just have wanted to use this photo since Chile, and so here you go. Love you both, and thank you sharing this adventure. If only you won’t so boring… excuse me (yawwwwwwn). Zzzzzzzzzzzz. The feeling is mutual. Bwaahahahahahahahaha. Can’t wait to see you soon! 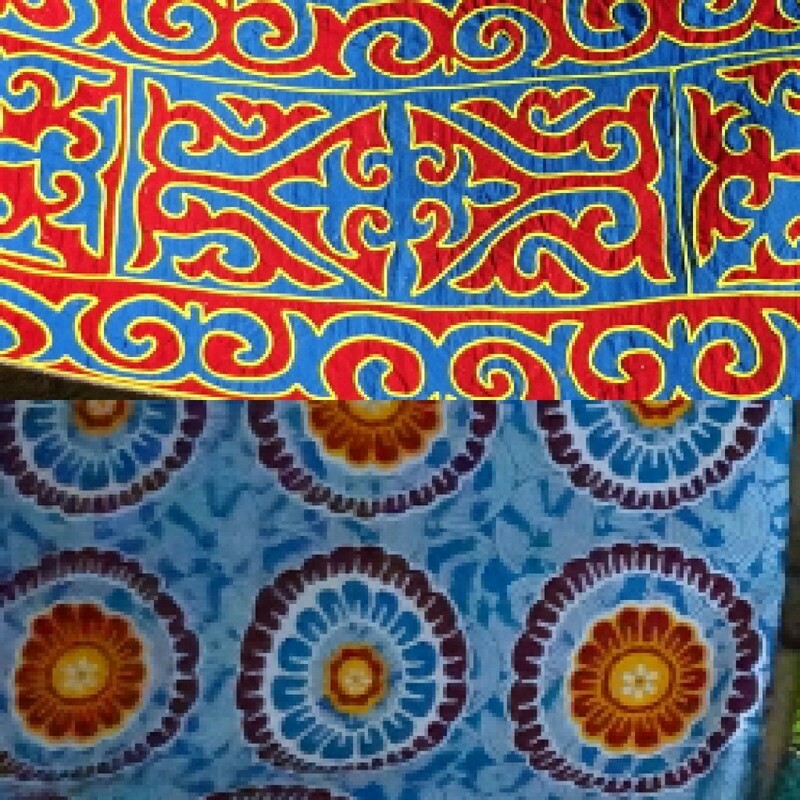 I have enjoyed your travel tales and pictures. Introduced my friends who love to travel to your site. Look forward to your final travel tales as your journey comes to an end. Welcome home! Thanks, Gail! One journey ends but our adventures always continues…more to come! Looking forward to seeing you. We plan to compare photos in Seattle in August. You’re certain to be there, right? Right! Safe travels home u two! USA or BUST! Aaron says, “no busting for us…it’s all blackjack in our world.” HA!! See you sooooooon! Thanks for joining us on our journey. We’re just as excited as anyone to see what lies ahead for us…stay tuned! Thank you for sharing your amazing journey. I have loved every bit of it!! I promise if you keep writing I will keep reading! Welcome Home! It makes us so happy to hear you like our writing. We have enjoyed every minute of it, too. Have a nice sta in boston and a warm welkom in sette! So nice we met in Almere! Thanks Dimphy! We can’t wait to see you in Anchorage and/or Seattle next year! We’re marking our calendar. You guys are beautiful so excited that I got to spend time on your adventure in Amsterdam with you both. See you on other side soon! Oh my gosh, we **LOVED** experiencing Amsterdam with you. What a special experience that we’ll all remember for a loooong time! Thank you so much for sharing your wonderful experiences. I have truly look forward to each and every one. Hope that every thing went well on your trip back to the US. Thanks for continuing the blogs for a little while longer. Enjoy retelling your wonderful stories to your family and friends. Hi Henrietta, thanks for following along this whole way. We have enjoyed writing about it so much more than we could have known at the beginning. There are quite a few more blog posts in draft at the moment, so still lots to look forward to!